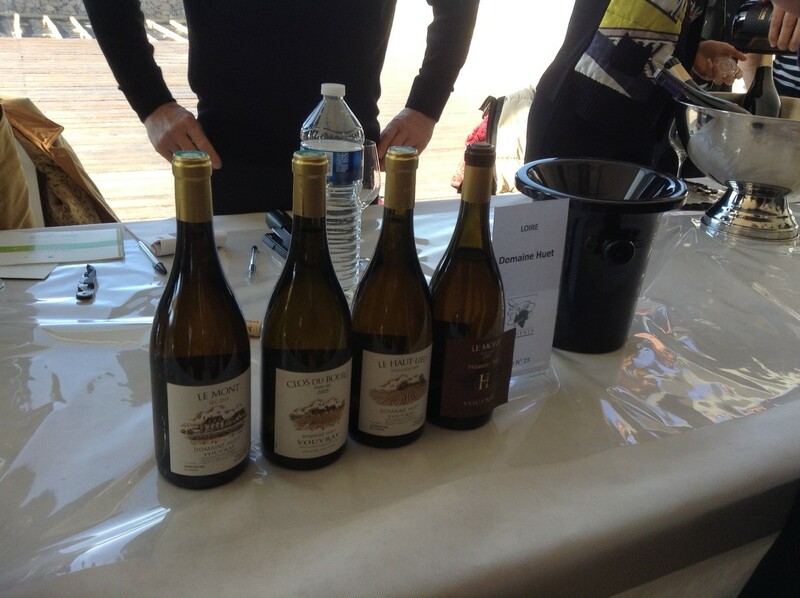 The annual wine event in the village of Faugères took place last weekend and I duly went along on Sunday for the tasting. Twenty five vignerons with stands along the streets and corners of the medieval village, all sharing their finest products, what is not to like? I have said many times before on these pages that Faugères is my favourite appellation in the region. The schist based vines produce deep flavours and a final twist of refreshment which leaves you wanting to taste more of the wine. I am looking for clean fruit, depth and compexity and that enjoyable palate cleansing finish. Some of my favourite domaines were not present at the event, Barral, Clos Fantine, Domaine des Capitelles but that meant the opportunity to try other domaines as well as reacquainting myself with other favourites. * Rosemary George was present signing copies of her authoritative book on Faugères and asked me whether I had discovered anything new, happily I had. A very enjoyable morning, lots of parades, stalls, music and fun. 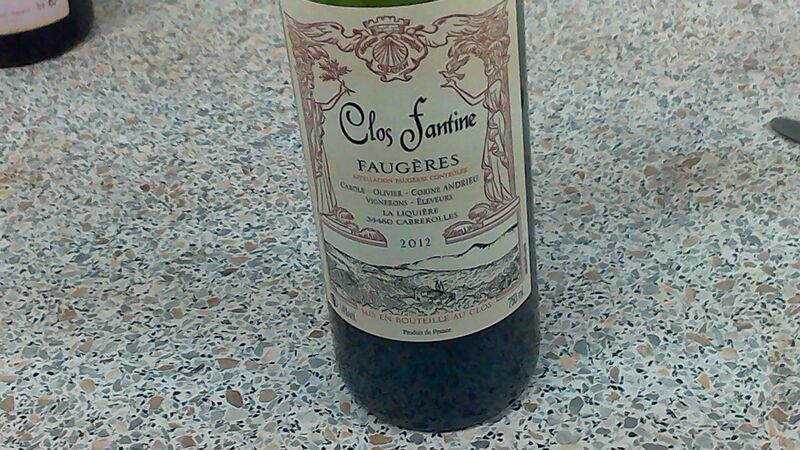 But most of all, a reminder that Faugères is so good. Incidentally all of these domaines are organic, other than Haut Lignières, this really is a pioneering appellation. 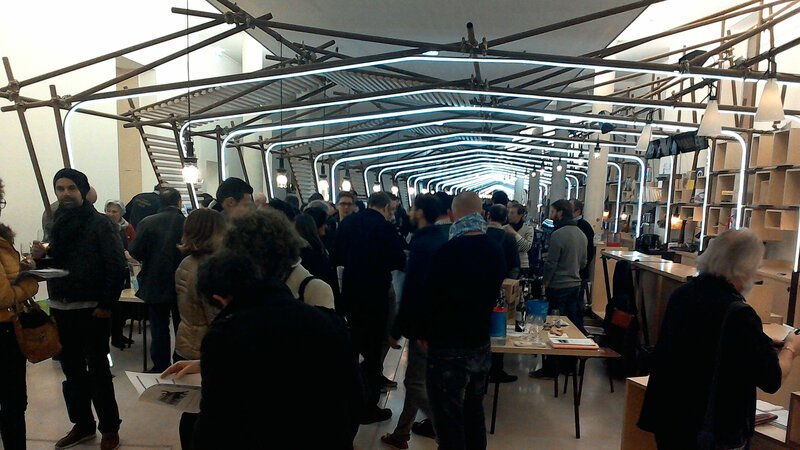 Categories: Tasting, Vignerons, Wines | Tags: Ancienne Mercerie, Causse Noire, Cébene, Faugeres, Graine Sauvage, Jérome Rateau, Mas Angel, Peyregrandes, Rosemary George, Valambelle | Permalink. And so, to the Languedoc and I visited a number of domaines, some I knew already some were names I wanted to follow up. I am glad to report that the region more than held its own against the others represented. 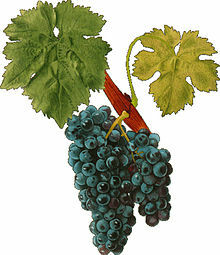 The Languedoc, and Roussillon, are sources of great wines. Chateau Maris is in the Minervois area, I enjoyed their wines at Millésime Bio last year and was pleased to taste the new vintages. Some were brut de cuve (straight from the tank so immature) and still a little young for me to really appreciate but there were some good bottles especially Las Combes 2014, 100% Grenache with ripe, round fruit balanced with soft tannins. Lovely now, better in a couple of years. 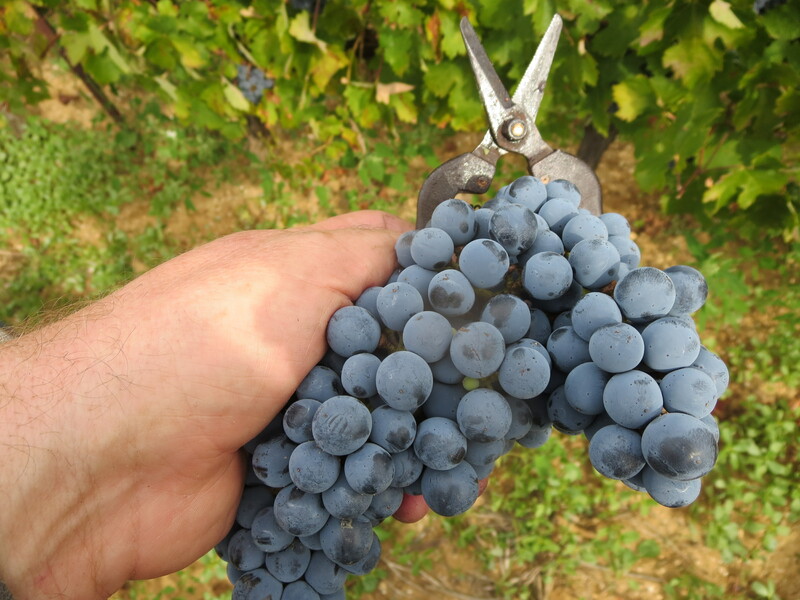 Domaine Gros-Tollot produce Minervois wines as well as other wines which are made outside the appellation rules. I confess to some bias against the domaine at first, two top Burgundy producers with a side project in the Languedoc? Surely this can’t be honest Languedoc wines. I was proved completely wrong. The wines are excellent, soft fruits with structure and complexity behind them, often from an outstanding use of oak which really does melt into the wine, adding to its aromas and flavours. I liked all the wines such as 2014 La 50/50, Fontanilles 14, and Combettes 14 which is produced from Marselan grapes, very much a Languedoc wine. Best of the bunch for me was La Ciaude 14 made from one vineyard of Syrah, Carignan and a little Grenache. Mas Gabriel is a firm favourite of mine, almost a neighbour in the village of Caux. 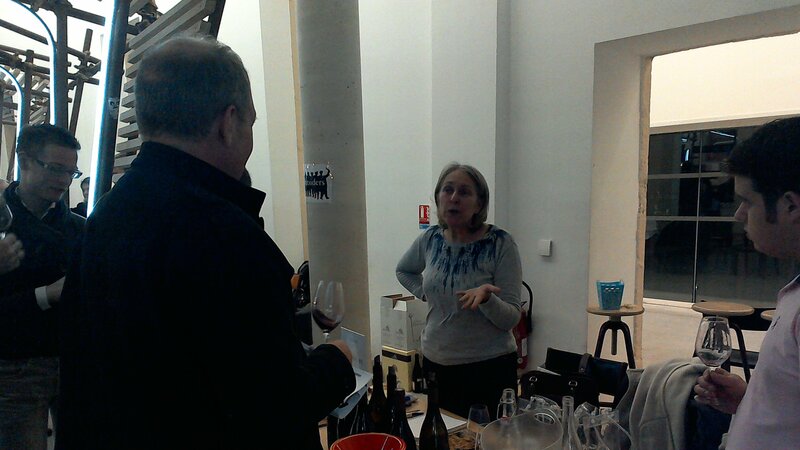 We enjoyed a chat with Deborah Core as well as tasting the new vintages of some of my favourite Languedoc wines such as the Carignan Blanc Clos Des Papillons. Special mention though for Les Fleurs Sauvages 2015, the rosé is medium coloured, clear though delicate red fruits and scents of those wild flowers. Very clean and dry it is a top quality rosé, which deservedly sells out very quickly. 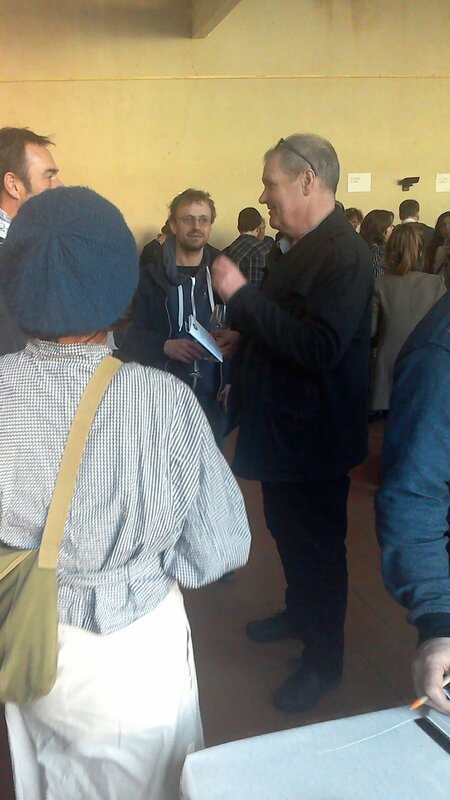 Le Conte Des Floris comes next, also based in Caux, though the new cellar is in Pézenas. I love the wines of this domaine, I can’t remember a dull one. Driving forces behind the Wine Mosaic project Daniel and Catherine Conte Des Floris make a great Carignan Blanc Lune Blanche, the 13 was excellent. 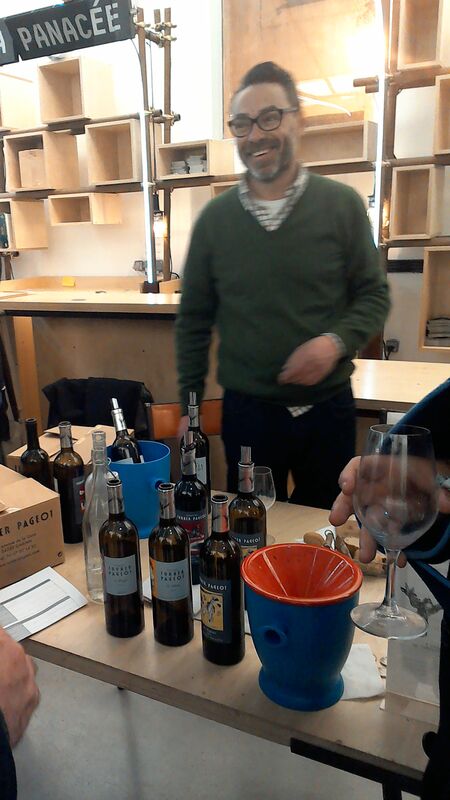 I really liked Carbonifère 12 and Homo Habilis 12 but my favourite was the Carignan Noir wine Basaltique 2014. Classic Carignan red fruits with an earthy, dark side adding complexity and, undoubtedly, longevity. 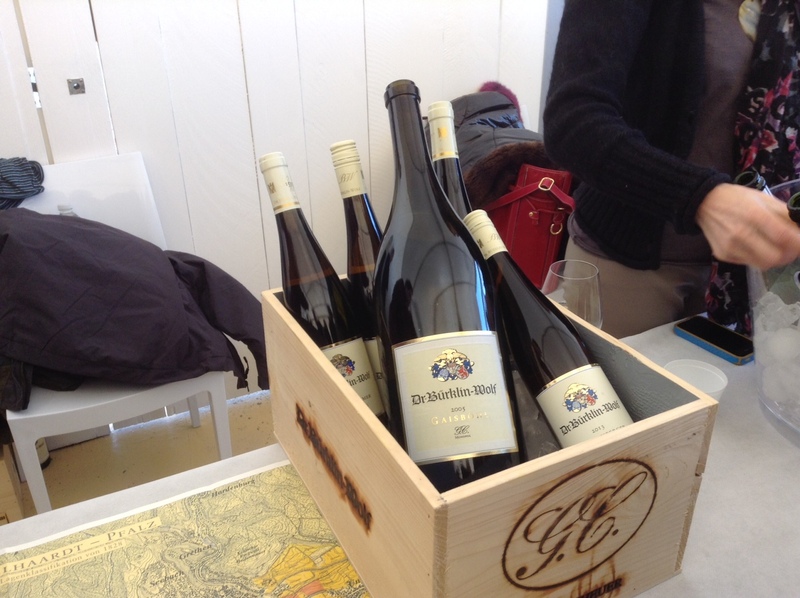 Amazingly long, very fresh, full of flavour – one of my favourite wines of the whole event. This is one of the very best Languedoc domaines. Alain Chabanon is a renowned Languedoc producer, I am told he takes no prisoners but it was his wife who presented the wines. 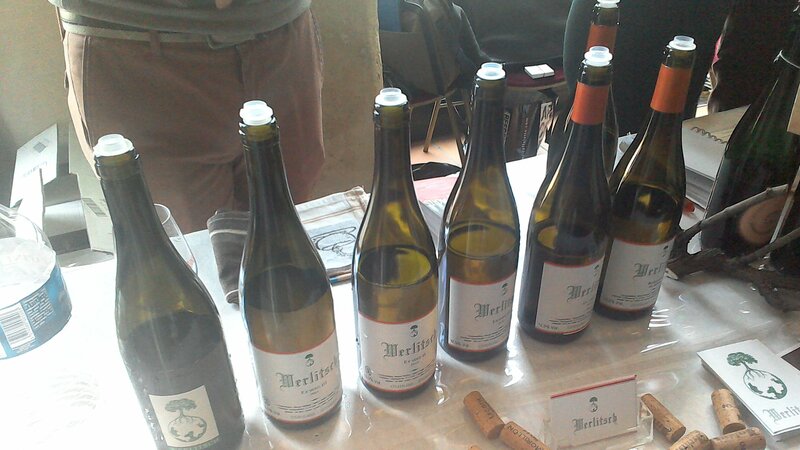 I have tasted them before, eg at last year’s Montpeyroux Portes Ouvertes, but they were on better form here. Campredon 14 and Saut De Côté 12 were both very good but my star was Les Boissières 2012. A classic Languedoc blend of Grenache/ Syrah/ Mourvèdre there was a depth of red fruits on the nose and in the mouth with complexity from 24 months of maturing before bottling. 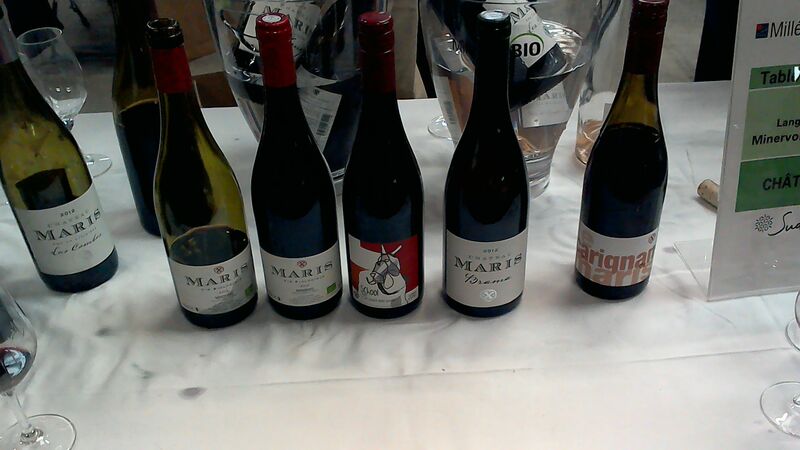 I preferred these three wines with classic Languedoc cépages to the more famous Merlot based wines which he makes. Incidentally his website is terrific with a short video of him presenting each of the cuvées and good technical detail. Domaine De La Marfée is another which I would consider to be one of the very best Languedoc producers, and another I know thanks to Leon. I highlighted every single one of the wines in my notebook, from the lovely Blanc 13 to the most structured of their wines Champs Murmures 12. Complex, full, fruity, Della Francesca 12 and Les Vignes Qu’On Abat 12 were equally good but I actually chose the simplest of their red wines as my star on this occasion. Les Gamines 2013 is Mourvèdre/ Syrah and a little Grenache with a lighter structure than the other reds but no less complexity and fruit. I liked it so much that when we went out to eat at Trinque Fougasse in Montpellier that night I chose this wine to accompany the excellent food. 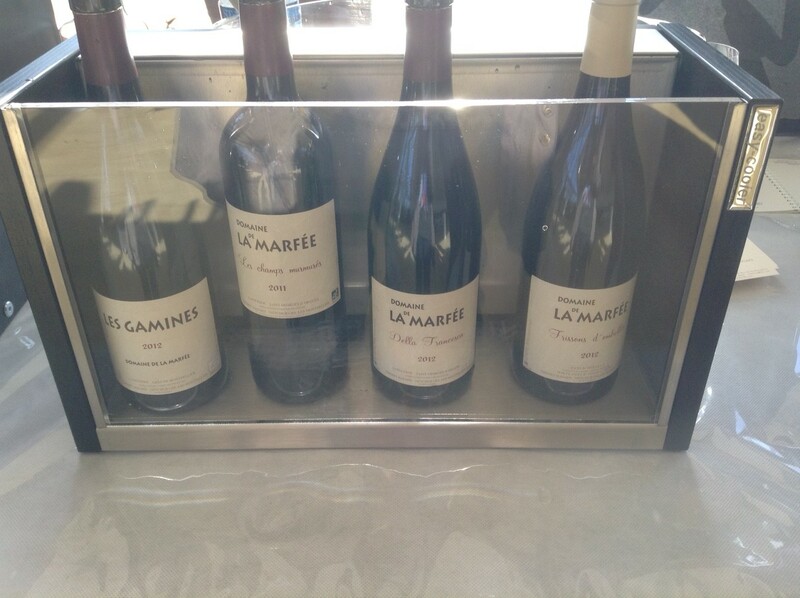 Rare to find a whole range which is outstanding but Domaine De La Marfée achieves it. 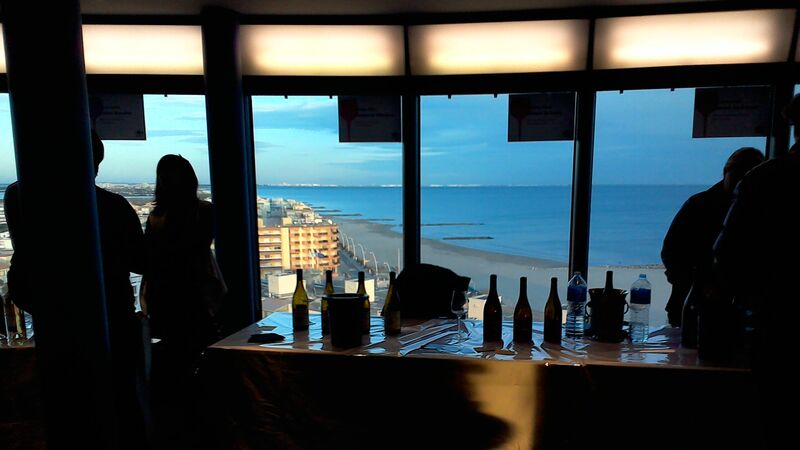 Domaine Canet Valette is yet another Languedoc star name, this time from the St. Chinian area. The reds are the stand out wines, Marc Valette described Antonyme as a vin de soif, his beaujolais, and it is a good everyday wine. I have often bought bottles of Une Et Mille Nuits in the past and the 2013 has delicious soft red fruits. The most famous name here though is Maghani and with reason. Marc served three vintages, 08, 10 and 14 and though the older vintages showed just how well it ages it was the Maghani 14 which I liked most. Concentrated and tannic still (this was a bottle made just for the event) there is an enormous depth of red fruits and real power, yet beautifully balanced. Mas Des Capitelles is a Faugères producer whose Carignan, Loris, was a wine which I really liked at a Millésime Bio offline where tasting reds was difficult. 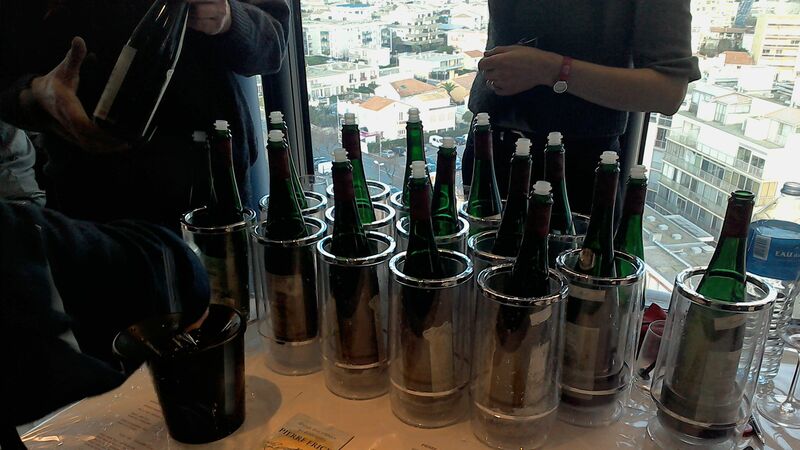 I wondered how in better conditions their wines would hold up and I am delighted to say they were even better. 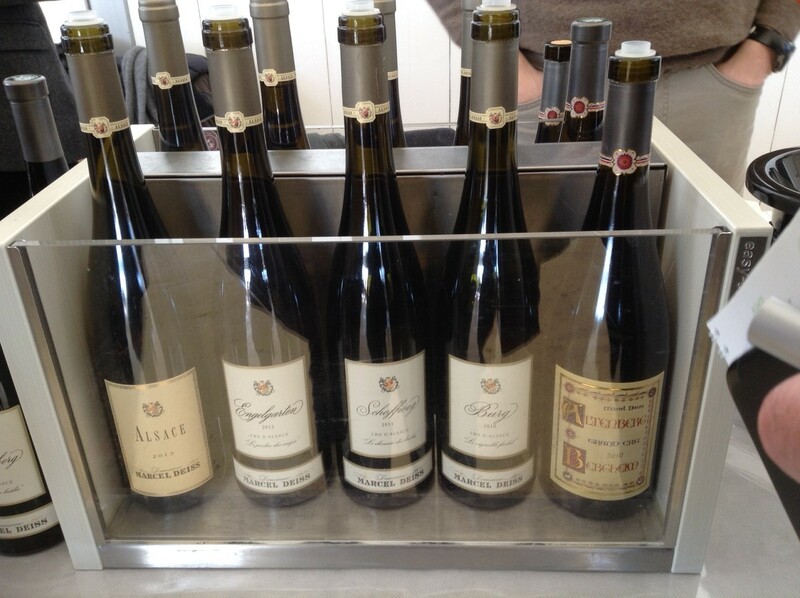 Catiède is classic Faugères from a vineyard under biodynamic conversion, 13 and 14 were good. The Vieilles Vignes 13 and 14 were even better, nice gentle use of oak to add complexity and extra depth from the greater use of Mourvèdre. Loris was good again, a new favourite of mine. Then we came to a series of three wines which the Laugé family make only in special years when they have an exceptional crop of one grape. Collection no. 1 2007 was made from Mourvèdre (with a small amount of Carignan and Syrah), and was chosen by the magazine Terre De Vins as one of their top 12 Languedoc wines. And for once I agree with a magazine! Complexity in a bottle, still fresh and youthful after all these years, great wine in short. Collection No. 2 is from 2011 and this time it was the Syrah which was exceptional and so dominates this wine. And no spitting this wine, I drank my glass. 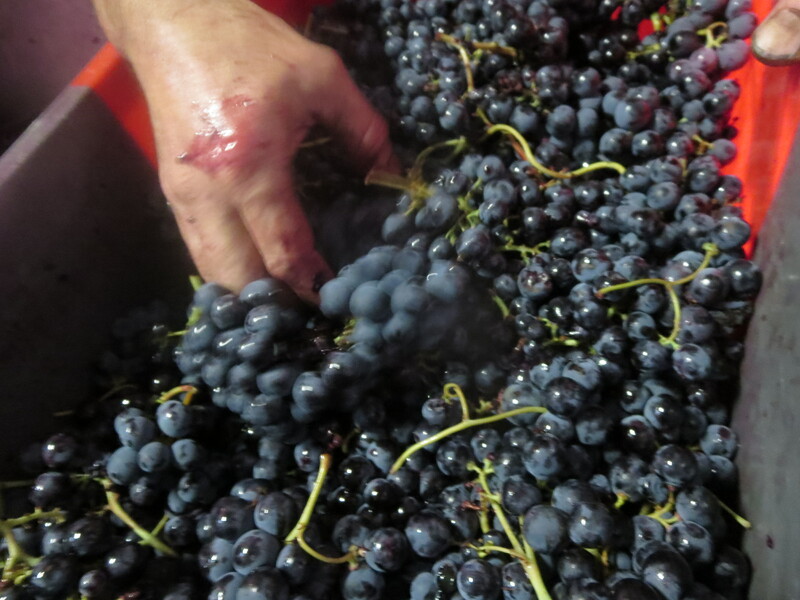 The Syrah leaps from the glass with its dark and red fruit aromas, the flavours match up and are deep and long. Great Syrah, great Faugères. I was also treated to a sample of the Collection No. 3 which will again be Mourvèdre led and it didn’t disappoint. Hard to choose just one wine but Collection No. 2 and that memorable Syrah just edges it for me. 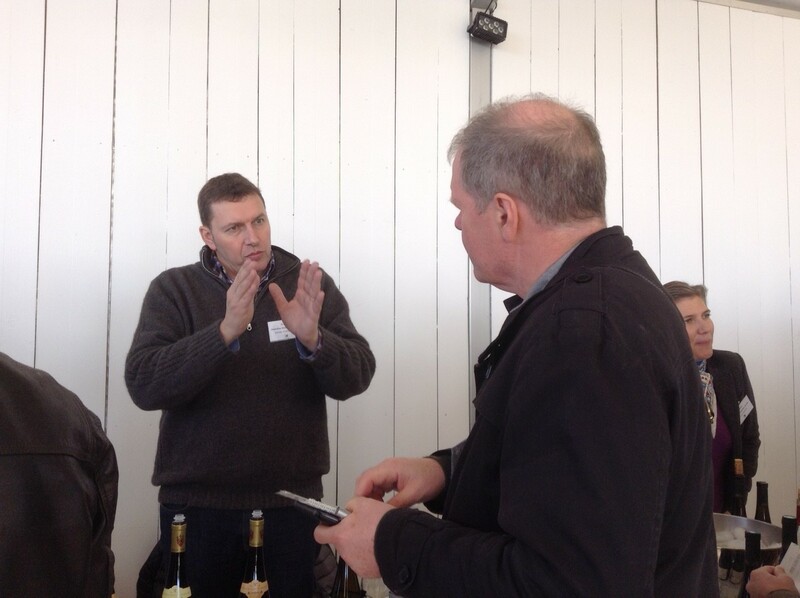 Faugères is, in my opinion, the Languedoc’s star region and I enjoyed meeting up with other favourite producers in their area of Vinisud (incidentally it was very useful to have the producers from one region all in on area). My friend and top class producer Brigitte Chevalier of Domaine De Cébène was there; Jérôme Py of Causse Noire whose wines are getting better and better including a lovely Mathias 2011; and Jérôme Rateau of Haut Lignières as well as his eponymous range including an excellent Sur Le Fil 14 which is not yet bottled. A very enjoyable salon, lots of good wines and a range of food stalls, wine accessories and various wine related activities. This is a salon for the trade and lots of business was being done all around. At the heart though is the wine and, happily, it remained the star of the show. 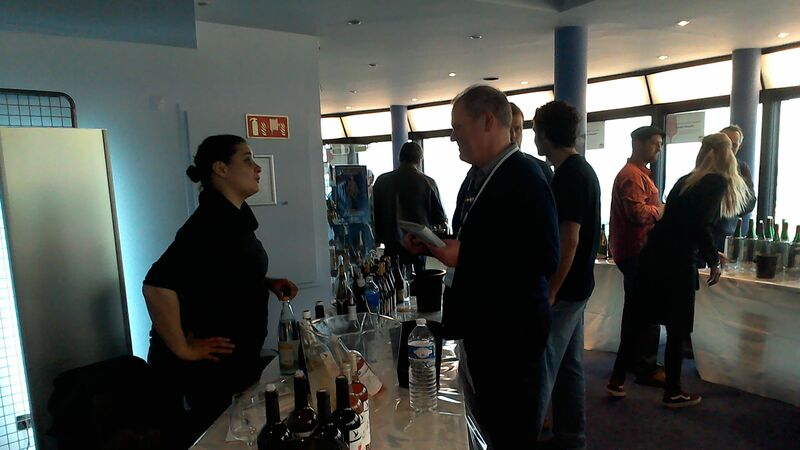 Part 1 of my Vinisud experience is here. Categories: Tasting, Wines | Tags: Alain Chabanon, Canet Valette, Causse Noire, Cébene, Clos Mathélisse, Domaine Ribiera, Faugeres, Grégory White, Gros Taillot, Haut Lignieres, Jérome Rateau, La Marfée, Le Conte Des Floris, Maris, Mas des Capitelles, Mas Gabriel, Minervois, St Chinian, Vinisud | Permalink. Since moving down to Margon it has been evident to me that many of my favourite bottles have been based around Carignan. A variety which received so much scorn for many years is now fighting back. 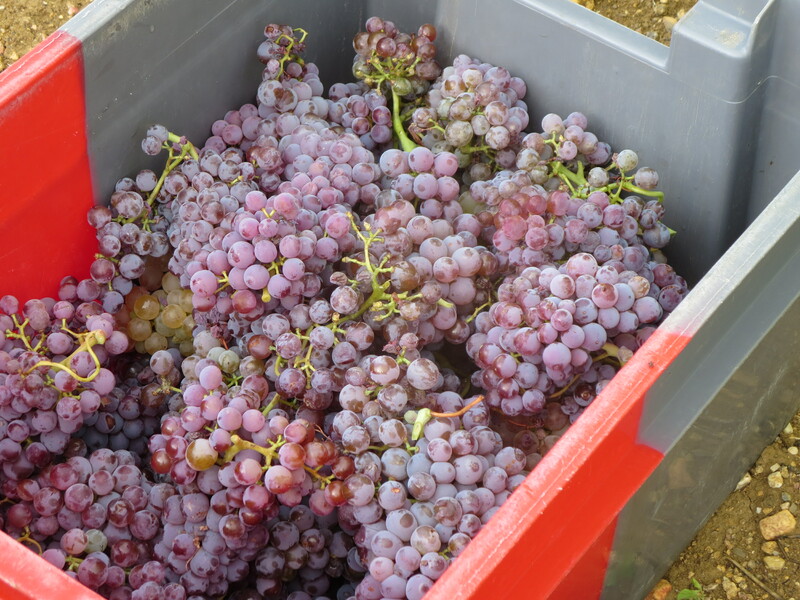 The excellent wine writer Michel Smith has been in the vanguard by writing a series of articles called Carignan Story on the les5duvin blog, championing the variety and the people who produce great bottles of it. 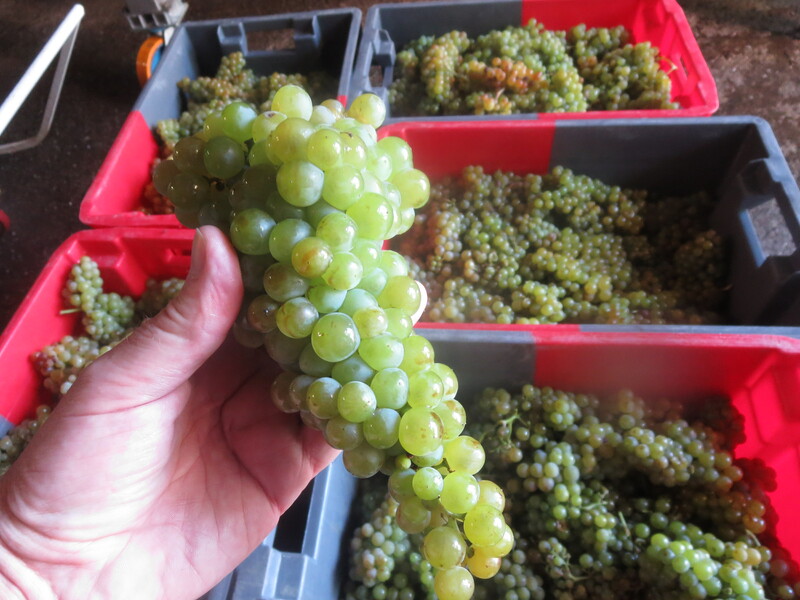 Moreover he is producing some himself in the Roussillon. (The blog is a must follow incidentally). I shall start with Mas Coutelou this time as Flambadou is the star of the 2013 vintage at the domaine and is a wine which ages brilliantly as a memorable 2007 testified during a vendange lunchtime. If you opened the link to Michel’s Carignan Story you will have already seen his support for this wine too. Jeff himself rates Cyril Fahl’s Clos du Rouge Gorge as one of the outstanding Carignan wines and based on my tasting in November (see Day 5) I would not argue. Domaine d’Aupilhac in Montperoux is another which has championed Carignan, blended in some cuvées or on its own in Le Cargnan which is a lovely wine showing the leathery, dark fruit flavours of the grape. I must mention the wine ‘Les vignes qu’on abat’ of Domaine La Marfée produced in Murviel lès Montpellier, a deep, dark joyful wine which needs a little patience in cellaring. Other lovely Carignan bottles tasted include Cébene‘s Belle Lurette and Treloar‘s Le Maudit, plus the cuvées Les Premiers Pas and Fontanilles from Les 2 Anes. 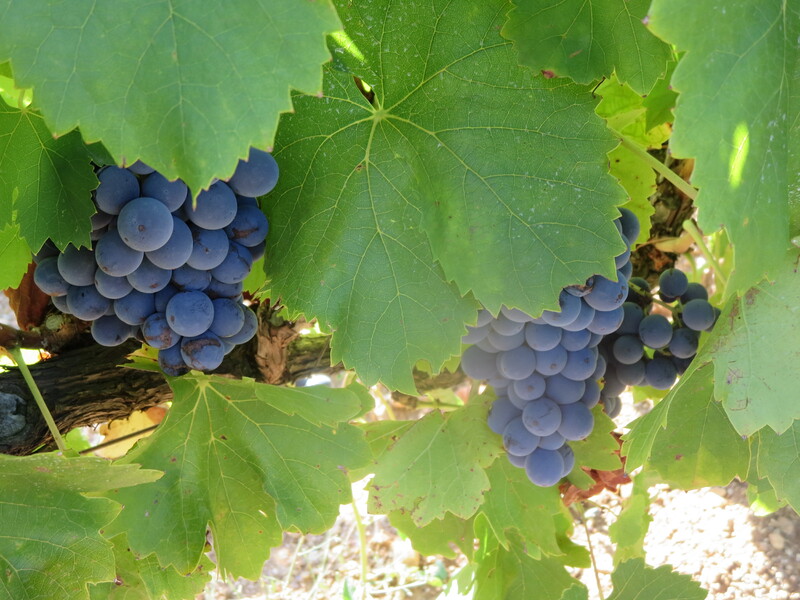 Domaine Sainte Croix (see Corbieres, Day 3) produces a couple of Carignan – led wines Magneric and Le Carignan, both express the wild garrigue of the Corbieres hillsides, lovely wines. 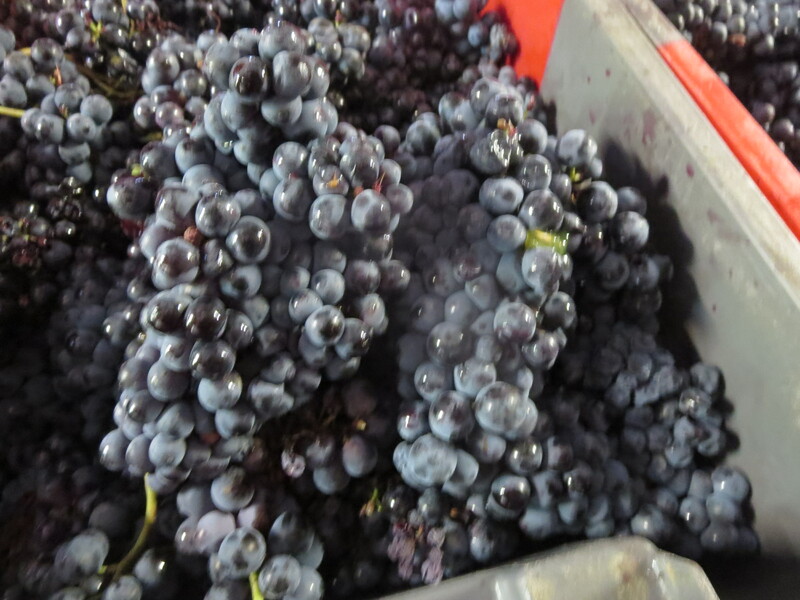 In the Minervois, Chateau Maris also produces lovely Carignans such as Anciens and (again) Le Carignan. 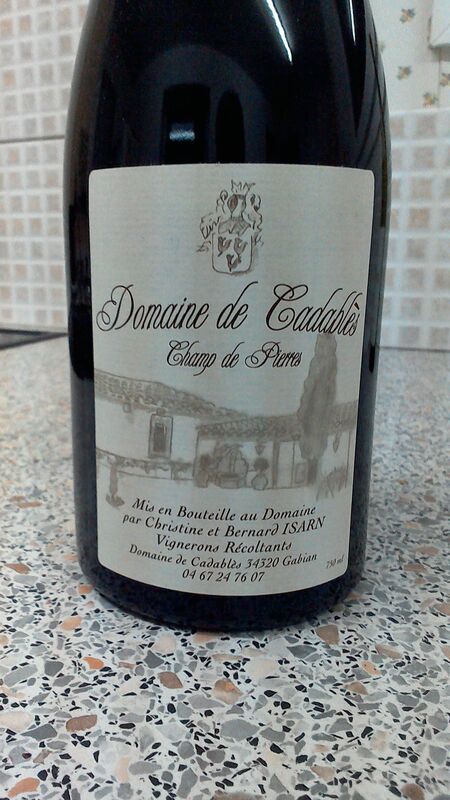 Finally, I should mention a domaine close to me in Gabian, Cadablès run by Bernard Isarn is starting to produce some really good wines not least the Carignan led Champ de Pierres. These are all wines I would heartily recommend, but that’s not the end of the story. Carignan Blanc is fairly unsual in the region but two of my favourite white wines come from this grape and both from Caux where we started. Mas Gabriel‘s Clos Des Papillons is dry, fruity and clean, with a rich texture that fills the mouth, simply delicious. Le Conte De Floris produces Lune Blanche which is just as good and I was happy to find some bottles in the wine bar in Pézenas recently. 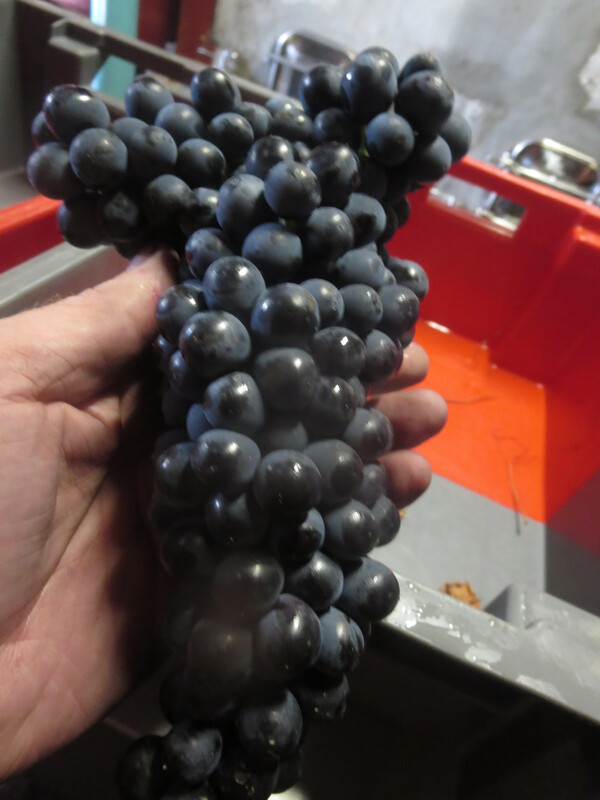 So Carignan, red and white, is a variety to investigate. 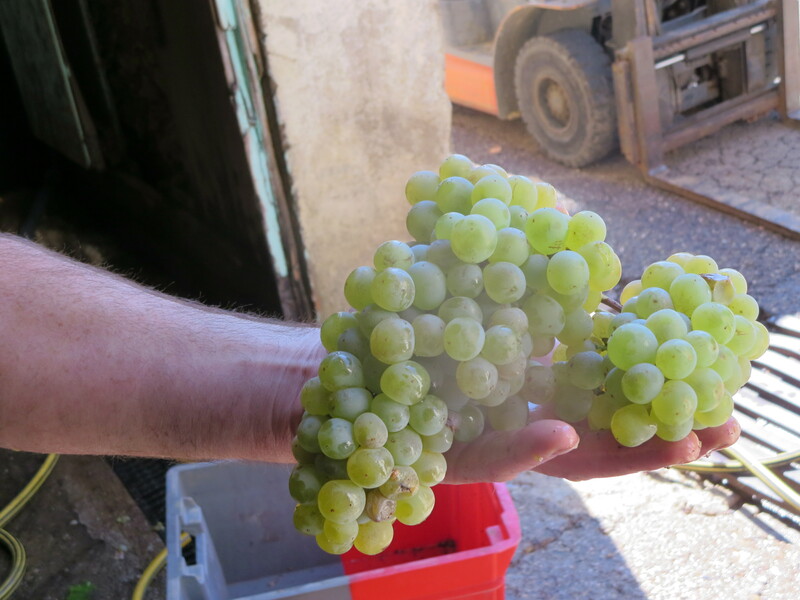 Dare I mention that Jeff produces another very good example of Carignan Blanc? Well I did leave him out of my 7Cs so I think it’s only fair. So those are my 7Cs, villages , areas and grapes which are all a source of great wine pleasure. I could have added more with St Chinian as just one example. Proof that Languedoc Roussillon is a region of great variety, a region of great excitement as winemakers rediscover and redevelop the character of wine in this fabulous part of France. Any feedback is always welcome. Categories: Vignerons, Vines, Wines | Tags: 2 Anes, Aupilhac, Cadables, Carignan, Carignan Blanc, Cébene, Chateau Maris, Fahl, Flambadou, La Marfée, Le Conte De Floris, Mas Coutelou, Mas Gabriel, Michel Smith, Rouge Gorge, Sainte Croix, Treloar | Permalink.